Lanzarote is the easternmost of the Canary Islands, located just 125 kilometres west from Africa's coastline. It covers almost 850 square kilometres and has about 130,000 inhabitants, nearly half of which in the capital Arrecife. Its proximity to Africa is reflected in the fact that (together with Fuerteventura is the driest island of the Canary Islands and parts are semi-desert areas. It's climate, beaches and some great (volcanic) landscapes attract numerous tourists, mainly from Europe. It was artist and architect Cesar Manrique who had a huge influence on how the island looks today. Because of him, you will find only one highrise building on the island, and is the island free of advertisements on the side of the roads. Besides this he built some of the biggest attractions on the island. Lanzarote is located 11 kilometres northeast of Fuerteventura, west of the Africa mainland, with Morocco its nearest neighbour. The island is about 60 kilometres long and 25 kilometres wide and has over 200 kilometres of coastline, of which only part is sand/beach, and the remainder is rocky. Its dramatic landscape includes the mountain ranges of Famara (671 metres above sea level in the north and Ajaches (608 metres above sea level) to the south. South of the Famara massif is the El Jable desert which separates Famara and Montañas del Fuego. The highest peak is Peñas del Chache rising to 670 metres above sea level. The "Tunnel of Atlantis" is the largest submerged volcanic tunnel in the world. 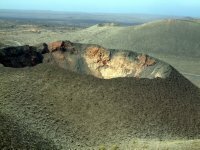 Timanfaya National Park covers a huge part of the central eastern part of the island. The moonlike landscape you see today dates back from the volcanic eruptions that took place between 1730 and 1736, and from a smaller eruption in 1824. Access to the park is prohibited apart from 3 footpaths, of which two need to be done with a guide, that can be booked at the Timanfaya visitor center. The other one is a footpath along the coastline, which is free for everyone. Needless to say, you should stay on the path and take litter with you. The most used option is however to drive up to the El Diablo restaurant, and to go on one the bustours that start from there. Take the LZ-67 either from Mancha Blanca (from the north) or Yaiza (from the south) and follow the signs. Upon leaving the LZ-67, you will have to pay the entrance to the park (€8). The ticket already includes the bustour. The bustour follows a 14 kilometre-long road, which was build under supervision of Manrique, and passes by the main features of the park. Apart from the tour and some demonstrations (including burning scrubbushes, and pouring water in the ground to create an artificial geyser), there is not much more to do. The Jameos de Aqua is one of the structures of Cesár Manrique, in which he tried to merge nature and culture. The structure is located in a partly collapsed lava tunnel. In the first part you will find what is called the great lake, which is an underground lake located in the old lava tunnel in which the rare albino crabs find their home. In the second part you see the pool, surrounded by a garden features. Behind the pool, and missed by many visitors is a venue, which can house up to 600 people, and is used for a couple of cultural events during the year. The Mirador del Rio is a lookout located at the northermost tip of the island, with great views over La Graciosa, Lanzarote's smaller sister island. (which can be visited by ferry from the town of Orzola.) At the Mirador you will also find a restaurant/bar. The Cueva de los Verdes, is basically a hollow lava tube which was formed after an eruption of the Volcano La Corona. The entrance to the caves can be found pretty close to the Jameos del agua. Lanzarote has one of the most perfect climates. Summers last from May to early October when temperatures are generally between 25 °C and 30 °C during the day and a pleasant 20 °C on average at night. Winters are a little wetter but still nice with temperatures from November to April mostly between 20 °C and 25 °C and nights of around 15 °C. The southern parts of the island are slightly warmer than the northern parts, which also see a little more rain. Lanzarote Airport (ACE) is located just 5 kilometres from the capital Arrecife. Numerous airlines serve the island. Arrecife Bus has regular connections to Playa Honda and Arrecife, from where there are connections to other destinations. Ryanair now serves the island as well, with flights to/from Bournemouth, Birmingham, Bristol, Brussels, Dublin, East Midlands, Edinburgh, Frankfurt, Girona, Glasgow, Liverpool, London, Madrid, Shannon and Weeze(near Düsseldorf). Easyjet serves Liverpool, Londen and Madrid as well, while Thomson Airways and Thomas Cook Airlines serve many British destinations as well. Hamburg International and Air Berlin mainly serve the German market, while Air Europa and (slightly less) Iberia serve Spanish cities. Other airlines mainly serve European destinations, including Paris, Amsterdam, Milan, Stockholm, Oslo, Copenhagen, Bergen, Gothenburg, Helsinki and Vienna. Gran Canaria and Tenerife have a flights as well and there are regular flights to Agadir in Morocco. Trasmediterránea provides ferries from Cádiz in Spain to and from the Canary Islands, including Lanzarote. Fred Olsen provides serves with other Canary Islands as well. Naviera Armas runs weekly services between Portimao in mainland Portugal to Madeira and on to Tenerife, with connections to other Canary Islands, like Gran Canaria and Lanzarote. Maybe the best way to get around and see a lot of the island is to hire a car. At the airport and in the bigger tourist spots, like Arrecife, Puerto del Carmen, Costa Teguise and Playa Blanca there are car rental companies. 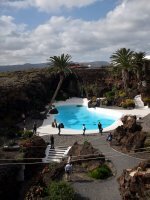 We have a comprehensive list of accommodation in Lanzarote searchable right here on Travellerspoint. You can use our map to quickly compare budget, mid-range or top of the range accommodation in Lanzarote and areas nearby. This is version 24. Last edited at 3:33 on Aug 2, 17 by sleepBot. 40 articles link to this page.